In terms of internet usage, there is almost nothing that can be done on a personal computer that cannot be done on a smartphone, with the possible exception of read the fine print. Which is why tablets were invented. The effect of the proliferation of smartphones and tablets is that affluent investors have their computer with them at all times. They just aren’t necessarily sitting at a desk at home or in the office when they are using those devices. Advisors need to constantly remind themselves that their client investors are always on their smartphones or tablets and are often looking for financial information. Their advisor’s website is where they often go to first to find that information. Spectrem’s updated study on modern investors and modern technology, Using Social Media and Mobile Technology in Financial Decisions, lists all the information investors want to be able to access on the website or app of their financial advisor. More than just personal information related to their accounts, investors are looking for tools to make key decisions about their money without having to speak directly to their advisor. There are many functions of investing which investors can do on their own. Such functions can often be handled using tools that advisors can make available to them on their website. In the Spectrem study, investors were asked to place their interest in such tools on a 0-to-100 scale, and the most popular item was a retirement planning tool and asset allocation for the greatest return. The interest level among Millionaires (those with a net worth between $1 million and $5 million0 for such a tool to be available to them via personal computer, smartphone or tablet was at 45.95. This is a key construct for advisors to consider for their website and apps. Often, investors choose not to discuss retirement in person with their advisor out of fear of facing the fact they have not done enough to prepare financially for retirement, or because they consider the option of retirement too far away to discuss immediately. A retirement planning tool would allow investors to consider their current retirement planning without having a face-to-face meeting with their advisor, and would probably help them understand the need for such a meeting based on the results of their personal investigation. 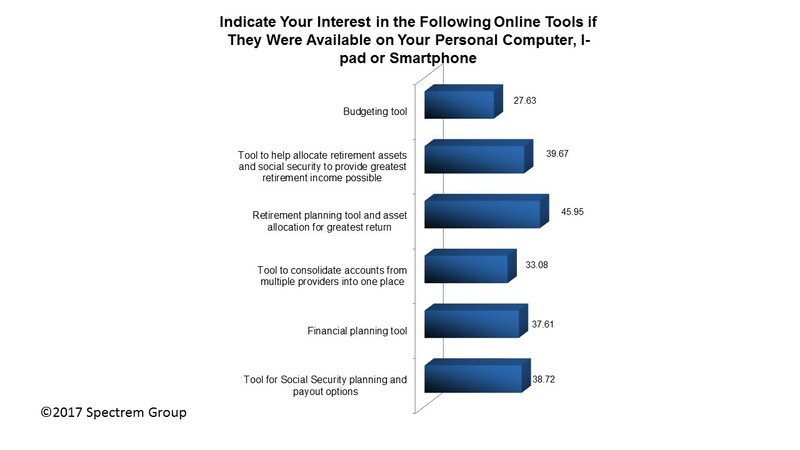 The next most popular choice among those offered to Spectrem study participants was a tool to help allocate retirement assets and Social Security to provide the greatest retirement income possible. This was rated at 39.67 among Millionaires, and is a key consideration for advisors to begin the consideration of Social Security benefits, a topic which Spectrem research shows is under-analyzed by both investors and advisors. Of lesser interest are tools to consolidate accounts from multiple providers in one place (33.08 among Millionaires) and budgeting tools (27.63). Does this information need to be available on both the website and the app? The answer increasingly is yes. Among Millionaires, 12 percent prefer using apps over websites, and among Ultra High Net Worth investors with a net worth of $5 million to $25 million, 16 percent prefer apps. Sixty-nine percent of Millionaires want to be able to access their personal information on their advisor website (and want to be able to do so using their smartphone or tablet), and 40 percent want to be able to read articles or research on financial topics and products. This may seem like a lot of information, but if investors are looking for it, they will find it, whether they find it on their advisor website or go elsewhere. Advisors and financial providers do need to consider developing apps to advertise their services and provide the tools investors want. The difficulty is that apps cannot provide as much information as websites do to gigabyte storage space, so a detailed investigation into what best to provide on the app needs to be conducted. Also, there should be some opportunity for investors to list the information they searched for on the app but could not find, so advisors can update their apps accordingly.